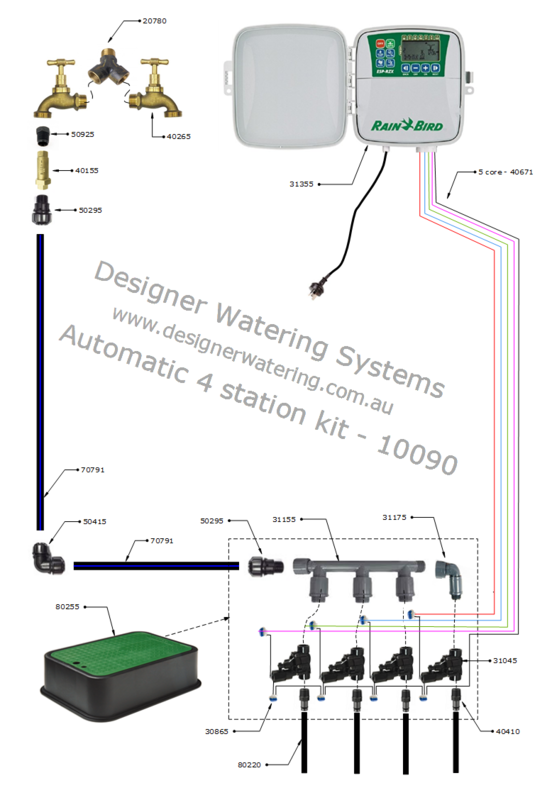 The Components Views above and below are an indication of what makes up a residential watering system. 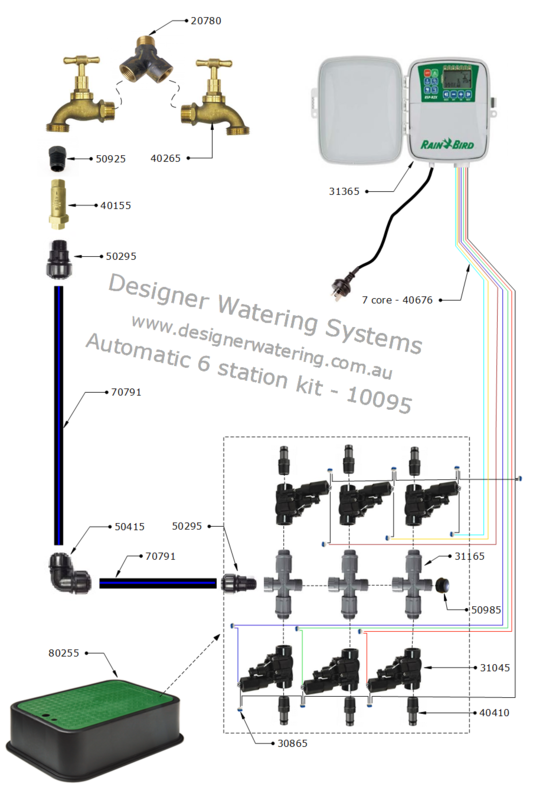 The numbers on the diagrams are product codes that can be entered directly into the 'Search Box' to take you to that component in our Online Shop, while the easiest way to select a Garden Sprinkler head is by selecting from our sprinkler info page. 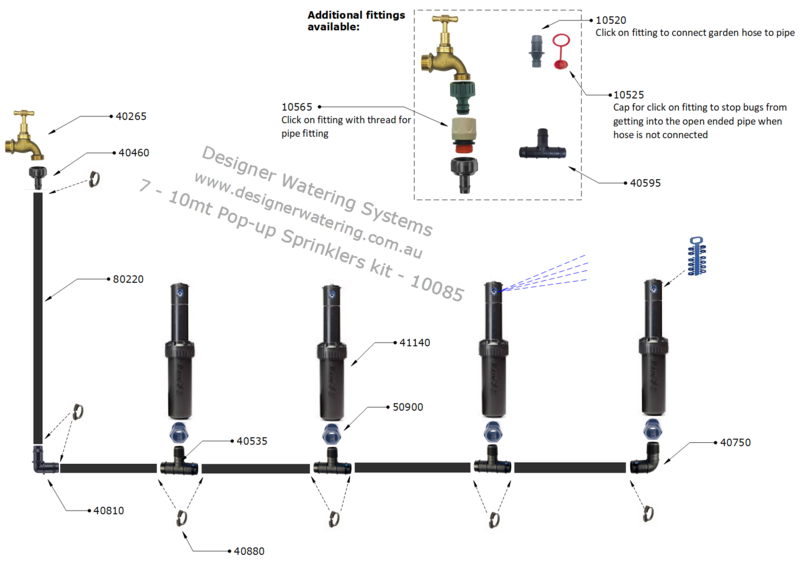 Both Contractors and DIYs alike normally use 25mm black Poly pressure pipe (which has a bore size of approx 20mm) from the water connection point to the on/off manual or automatic control valves, then 19mm black “low density” poly pipe from the valves out to the sprinklers. Pipe with a bore size of approx 25mm is the next size up, for those people with higher flowrates (which means you may be able to run more sprinklers at once) and/or longer pipe runs where you would lose a lot of pressure in smaller pipe. Connecting straight to the Tap with pressure pipe, low density pipe, manual multi-outlet distributors, manual timers or battery-operated automatic timers. Adding a 2nd Tap to your existing Tap for your Irrigation system, so that you still have a Tap for general use. Connecting into your house mainline, somewhere between the water meter and the front of the house. In Brisbane, this mainline is usually 20mm or 25mm Poly pipe, Copper or Galvanised Iron. The most popular connection point is the front Garden Tap which is usually connected straight to the house mainline, and therefore should still have a reasonable flowrate without having to cut into your mainline. This is Option 2, and the one shown in the Components View. Manual twin tap and multi-outlet distributors connected straight to your Garden Tap. The final shut-off operation should be controlled by the Garden Tap as these valves are not pressure rated. Manual in-line valves. The final shut-off operation should be controlled by the Garden Tap as these valves are not pressure rated. Battery-operated single & multi-station automatic Controllers and Valves. In most cases these are of a lesser quality than the 24Vac Controllers. 24Vac automatic Controllers and Valves. The Controller plugs into your 240Volt power point then has a Transformer reducing the power supply to a safe 24Vac. The most popular method of automatic control is Option 5. The method of manual control is purely a personal decision, however, if you are looking at converting to automatic at a later date, go with Option 3. Option 5 is shown in the Components View. Water supply (Water connection point to the control valves). Manual or Automatic sprinkler zone control, whichever is applicable. 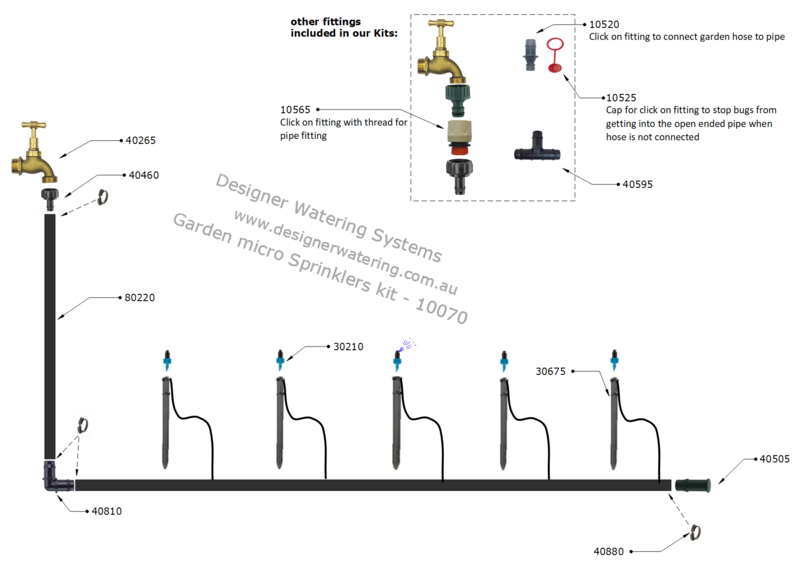 The sprinkler zone which includes sprinklers, sprinkler pipe and fittings. Do not exceed 80% of your available Flowrate from your tap. The leftover pressure will go toward propelling the water outwards. Stay within a 30Lt/min flowrate for the 19mm Pipe, even if you have better flowrate results, as the faster moving water may cause blowouts. Total sprinkler flowrate will be calculated by adding together all the individual sprinkler flowrates within a zone (see Sprinkler Info page). Do a Head to Head sprinkler layout along a lateral run. This means sprinklers with a 5mt radius should be spaced no further than 5mt apart creating at least 100% overlap. 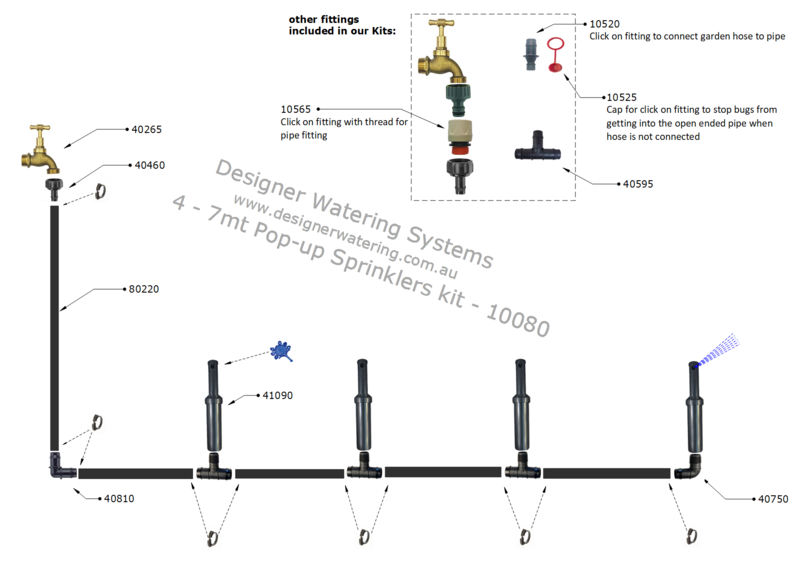 Mid-range single jet rotating lawn sprinklers. Longer range single jet rotating lawn sprinklers. 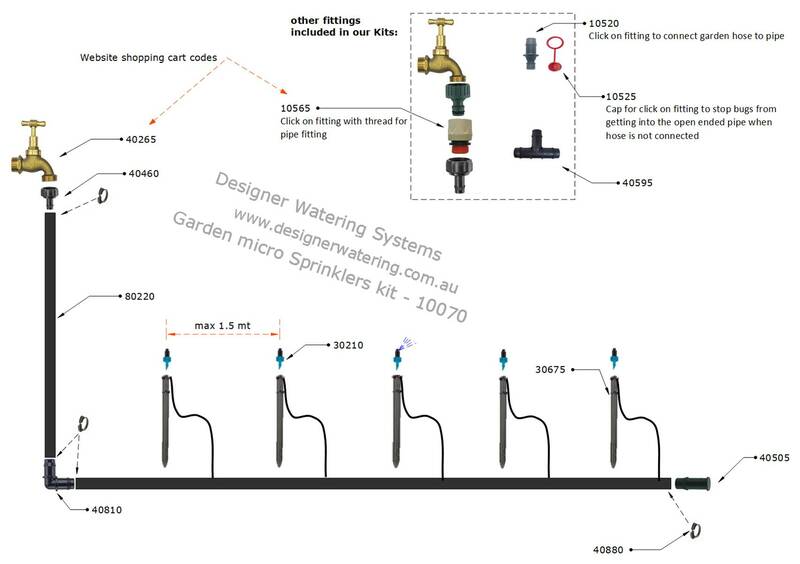 Our sprinkler design service enables you to not only buy all the components that you require to establish an effective sprinkler system on your property but ensure that your sprinklers are properly positioned for optimum efficiency and coverage.